Just 6 ingredients, gluten-free, vegan and no bake, these are a healthier version of the classic and so yummy! 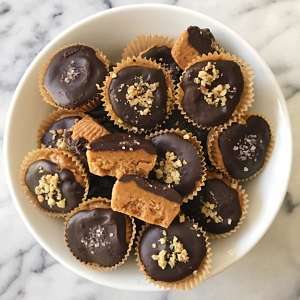 No matter what new treats we’re trying, these MINI CHOCOLATE PEANUT BUTTER CUPS remain a fan favorite. There is always a stash in our fridge or freezer. 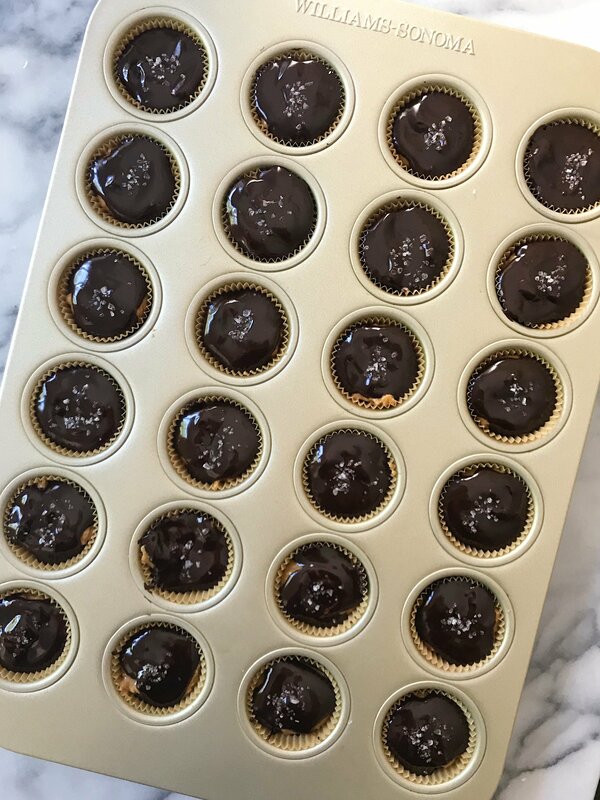 Just 6 ingredients, Gluten-free, Vegan and no bake, they are a healthier version of the classic and SO YUMMY! 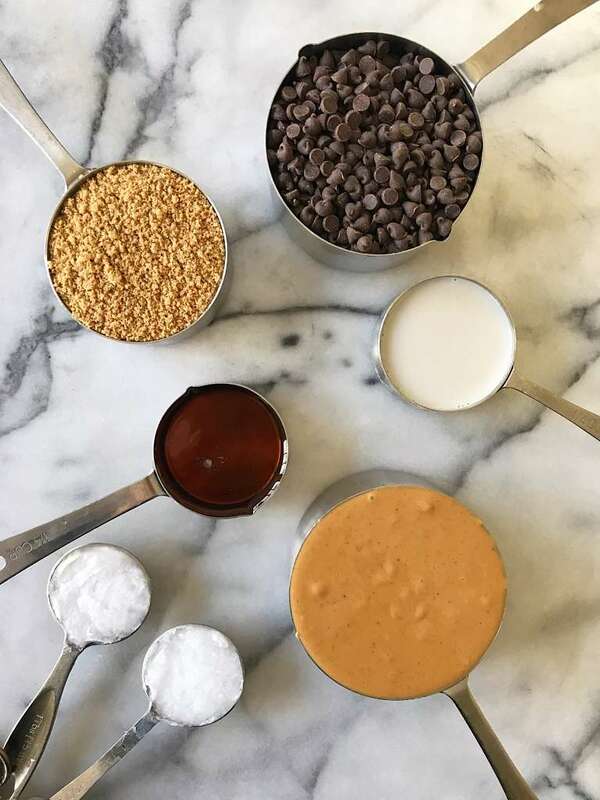 And they are made with only 6 ingredients: natural peanut butter, maple syrup, graham cracker crumbs, coconut oil, mini dairy free chocolate chips and dairy free milk of choice. The graham cracker crumbs are mixed in with the peanut butter for a little crunch and they are topped with sea salt or chopped walnuts for some extra yumm! And did I mention they are SUPER easy to make? Perfect to meal prep a batch and keep in the fridge or freezer for when you want something sweet. In a saucepan, you’ll heat the peanut butter and coconut oil until melted, then stir in the maple syrup and crushed graham crackers. Then scoop the mix into the mini muffin tins. One of my kids likes the just like this— without the chocolate! I however, love the chocolate on top! So next you melt the chocolate chips and almond milk and pour over the peanut butter mixture. Top with walnuts or sea salt if using and let set in the refrigerator for a few hours. You can eat them warm… they’ll taste great! But they’ll hold form better obviously if you let them set. For guidance on finding safe Gluten-Free Halloween Candy, check out this post by GF Jules and this list from About.com. As a reminder, use these or any list as a guide and always use your own best judgment as ingredients, formulations and manufacturing processes change constantly. Just 6 ingredients, gluten-free, vegan and no bake, these chocolate peanut butter cups are super easy to make and SO YUMMY! Store well in the refrigerator for several weeks or the freezer for several months. 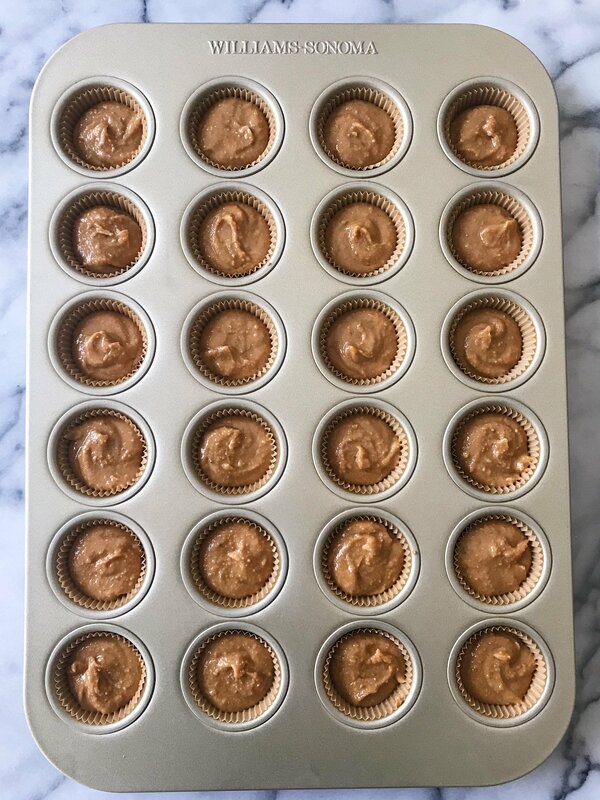 Place parchment baking cups in 24 mini muffin tins and set aside. In a sauce pan over low heat, mix peanut butter and coconut oil until well combined/ peanut butter softens. Add graham cracker crumbs and maple syrup. Stir until well combined. Remove mixture from heat and divide evenly among muffin cups. In a small saucepan, over low heat, add chocolate chips and almond milk. Stir until the chocolate has melted and mixture well combined. Spoon melted chocolate mixture evenly over the peanut butter mixture. Place in refrigerator to set for at least 2 hours before serving. omg! These were so easy to make and so awesome . I’ve made them twice already . I had to substitute Barney’s almond butter the second time because I had no natural peanut butter and my daughters wanted them ASAP! They were just as delicious !! For sure! My kids LOVE them! Let me know how your family likes them! So happy you love them too Lucy! Thanks for sharing! OMG these are now a staple in our house. The crunch from the crushed up cookie takes these over the top!!!! YAY! SO happy you love these as much as we do! They are a staple in our house too! These look amazing, I can’t wait to try them today! Can I substitute regular oil for the coconut oil as I am allergic? Thanks! They are a fan favorite in our house! Long ago, we used to make them with dairy-free butter (like Earth Balance) in place of coconut oil… I might try that before another oil. Let me know if you try them! Aw, thanks Maida! So happy you love them as much as we do! And I agree- they are super satisfying!